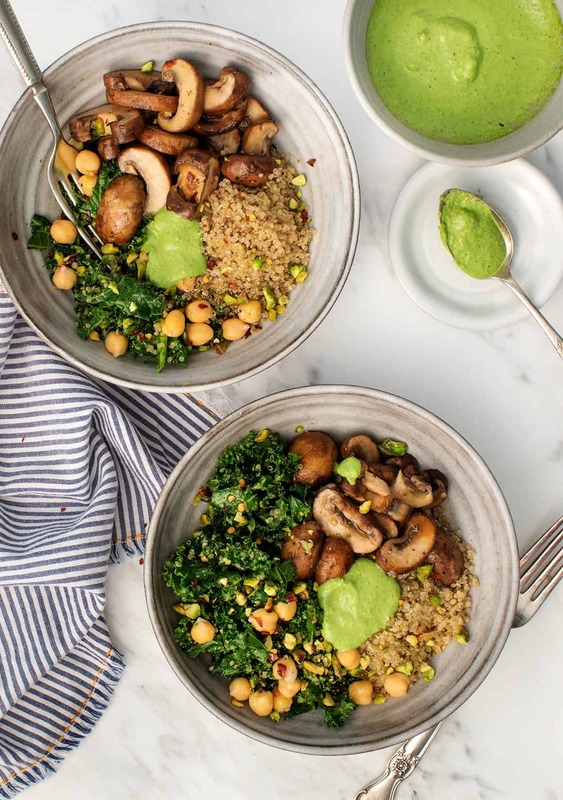 Tangy balsamic mushrooms, quinoa, chickpeas & a bright kale pesto top these yummy bowls. Easy & healthy, they're weeknight dinner perfection. Well, here we are, spring is almost here, and I’m still alive, still cooking, and still using Instacart. We’re partnering with ALDI on this post to announce to you that ALDI is now on Instacart(!) in Chicago, Atlanta, Dallas and Los Angeles. What’s great is that the prices are the same as the in-store prices and the only challenging part was meeting the $35 minimum for free delivery. It’s a happy problem to have because everything at ALDI is so darn affordable. I got the fresh ingredients for these bowls as well as a restock of pantry staples such as olive oil and extra cans of chickpeas. If we ever get snowed in, at least we can make hummus. Now it’s time to talk about these bowls! These are my “I’m-ready-for-spring-but-it’s-still-winter” bowls. They’re warm and hearty, yet fresh and bright. I started by using an Ambiano Professional Nutrition Blender to make a super creamy green pesto-like sauce using raw kale and pistachios. 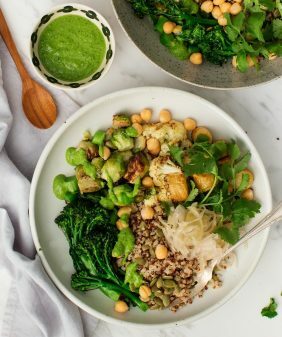 I tossed (more) kale with some of the sauce and piled it into the bowls with quinoa, balsamic-y mushrooms, chickpeas, crushed pistachios, and red pepper flakes. It all comes together in roughly 30 minutes and while the concept is very simple, it’s so, so delicious. 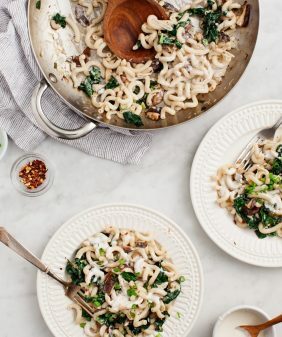 Kale Pesto Mushroom Pistachio Bowls are a great healthy weeknight dinner in fall, winter, or spring! These easy, gluten-free & vegan bowls take just 30 minutes to make. Use leftover pesto on salads, roasted vegetables, sandwiches, or eggs! 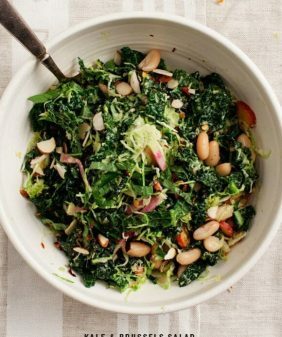 Combine the pistachios, garlic, kale, lemon juice, sea salt, pepper, ¼ cup olive oil and ¼ cup water in a small blender and pulse until pureed. Heat the oil in a large skillet over medium heat. Add the mushrooms, ¼ teaspoon sea salt, pepper, stir to coat, then cook 8 to 10 minutes or until the mushrooms are browned and softened, stirring occasionally. Remove from heat and toss with the balsamic. 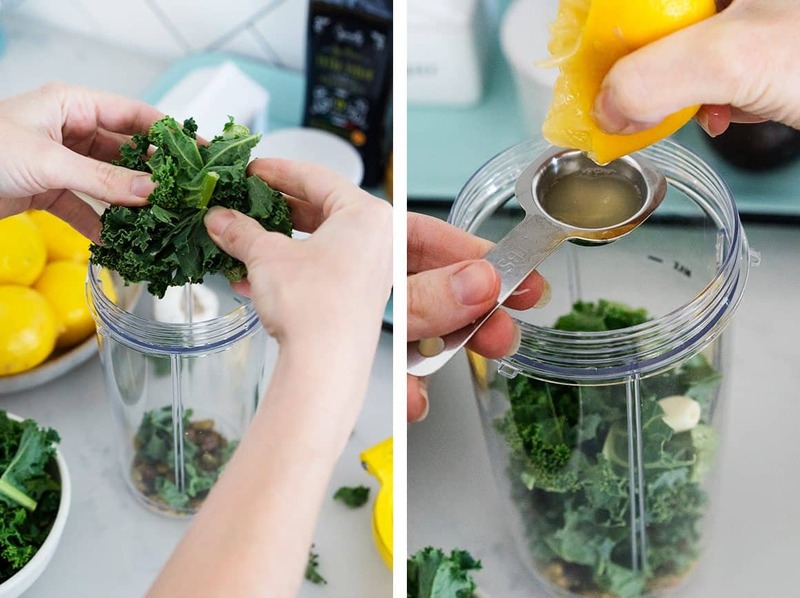 In a medium bowl, finely chop the remaining kale and remove any tough stem pieces. 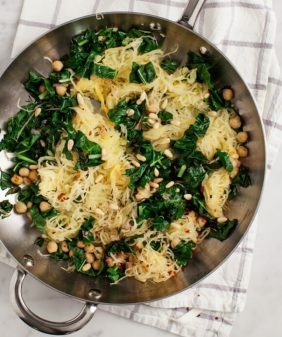 Toss with a few scoops of the kale pesto sauce and season with salt and pepper. Toss and gently massage. 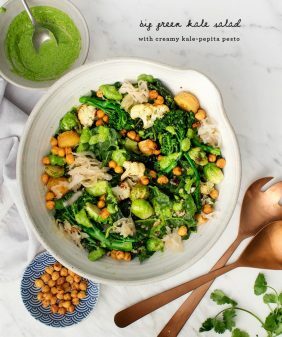 Assemble the bowls with the cooked quinoa, kale, mushrooms, chickpeas, pistachios, red pepper flakes and generous scoops of the sauce. Season to taste. And here’s a peek at my Instacart order, which included the grocery items for this recipe, plus some of my favorite everyday grocery staples. This post is in partnership with ALDI. Thank you for supporting the sponsors that keep us cooking! 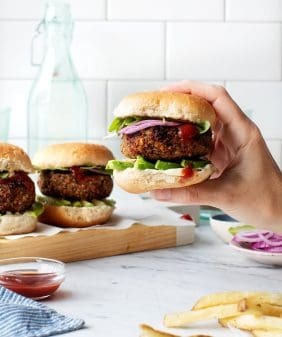 Save $20 on a $35 or more ALDI Instacart order, enter the code LOVEALDI at checkout. Will try the recipe this weekend. This looks SO good! Especially that sauce! That’s a perfect spring recipe! I will be trying it over the weekend. a very creative grouping of ingredients in this recipe, thank you, I wouldn’t have otherwise been able to dream up this one, so creative kudos to you! Perfect anticipation of spring dish & super easy. I thought I would have leftovers for lunch, but the boyfriend polished off the sauce straight out of the blender (apparently Jack was not the only one who enjoyed it that much). We will make more! Love this! Going to make it tonight. This was extremely delicious! Thank you so much for this recipe. Delicious! Doubled the recipe and made enough for my lunch all week! Hi Sara, I’m so glad you enjoyed these! This looks delicious! Do you have any suggestions on a substitution for chickpeas in the dressing? Thank you! Hi Ashley, there are no chickpeas in the dressing, just in the bowls! i’ve started using instacart for the same reason – not wanting to leave the house in crappy weather! – but now i’m hooked and don’t see myself stopping anytime soon.